Still on the Road to Freedom nods to country-blues, embodied by Alvin’s gutbucket harp on “Save My Stuff” (“I was a big fan of Big Bill Broonzy, Sonny Terry and Brownie McGhee”) and the delta stomp “Blues Got Me So Bad” (“My blues name is Deaf Lemon Lee”). He evokes a folksy feel in the stark acoustic “Walk On, Walk Tall,” perfects the sensuous slow blues of J.J. Cale in “Nice and Easy,” and strums south-of-the-border Mexicali rhythms in the instrumental “Song of the Red Rock Mountain,” a song he made up on the spot while testing a microphone and wasn’t able to improve. 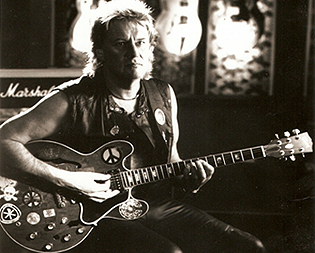 All songs written by Alvin Lee.